Can long distance runners improve their overall body posture by focusing on the head-to-neck alignment? Yes and no. It depends on if they are self-correcting or receiving a correction. This case study from our practice and a little bit of research sheds light on this important topic. When long distance runners begin to investigate the possibility of improving their running posture or the mechanics of their stride (also known as gait analysis), they are often told to focus on their hips, knees, and ankles. Research into changing the position of the head, neck, shoulders, and arms while running has shown little effect on the amount of energy expended by runners, as detailed by this helpful article summarizing research at Gonzaga University. The runner focusing on keeping his or her head upright can change the runner’s perception of how much energy they are putting into running. And this is important and shouldn’t be discounted on the psychology of how the runner is pacing. But the point remains: the overall heart rate and oxygen use haven’t been shown to change as the head/neck position changes, as the runner is self-correcting. So, if changing running posture is to help runners, then most of the focus is placed on changes from the the waist down. The common conception is that working locally on the pelvis is the best way to help the hips, working locally on the knees is the best way to help the knees, and working on the ankles is the best way to help the ankles. That is why gait feedback, muscle training, and rehabilitation is almost always focused on the waist downward. This makes such obvious sense, and the results are often substantial enough that many chiropractors, physical therapists, and other body workers don’t consider the possibility of investigating the alignment of the head/neck on the posture and gait of runners. Especially when the consensus is that changing head position doesn’t really affect performance. This blog post and single video are not going to solve the mysteries of the universe about running, gait analysis, and posture. But what I hope it does do is help some runners, other athletes, and the providers that serve them to stand back and take a global view of the posture and its relationship with the base of the skull. Chiropractic specialists of the top of the neck (upper cervical chiropractors) have a universal experience in seeing the shift of the pelvis to a more balanced position seen in less rotation, less unleveling of the hip (ilium), and less length length deficiency (short leg). We also tend to see a shift towards an improved upright posture (less thoracic or lumbar list) when viewing the body from the front, and less of a forward lean (forward head posture) when viewing the body from the side. These are accomplished with the gentle release of the muscles and joints at the base of the skull. The video embedded in this post is one example of the shifts possible when the head-to-neck alignment improves – not when the runner attempts to self-correct – but when the upper cervical specialist unlocks the posture via the neck, shifting the pelvis, and even the position of the knee and the foot. What’s the takeaway for long distance runners and providers who focus on gait analysis in order to help their running patients? 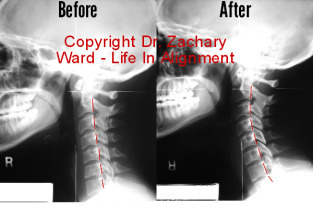 Shifts in head-to-neck alignment, when provided by chiropractors who practice these upper neck procedures provides an avenue to shift global posture and pelvic posture that can enhance and even provide a basis for future fine tuning. In other words, unlock the neck and you can’t help but unlock the pelvis. And that will have an affect on performance in many cases.